THEMIS Image of the Day, September 14, 2016. 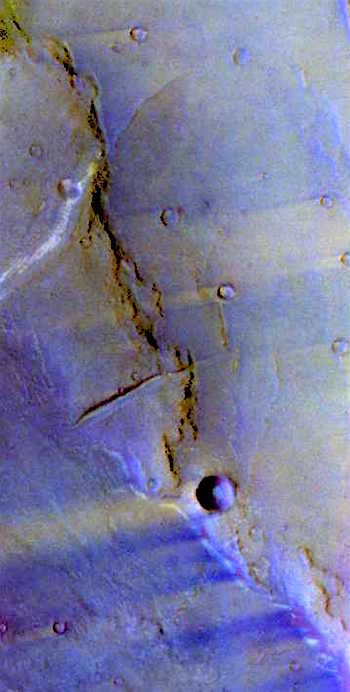 Today’s false color image shows part of Syrtis Major Planum, between Nili Patera and Meroe Patera. The THEMIS camera contains 5 filters. The data from different filters can be combined in multiple ways to create a false color image. These false color images may reveal subtle variations of the surface not easily identified in a single band image. This entry was posted in Reports and tagged Arizona State University, ASU, eolian processes, Mars Odyssey, Meroe Patera, NASA, Nili Patera, Syrtis Major, THEMIS, THEMIS Image of the Day, Thermal Emission Imaging System, volcanics. Bookmark the permalink.